World Of Tomorrow - "III"
World Of Tomorrow returns with more of their brand of free-jazz that combines Sun Ra styled big band with space noise and electronic efx. I write this review shortly after seeing the band's performance at the Strange Daze 2001 Space Rock Festival, and it's to festival host Jim Lascko's credit that he recognizes this group of horn blowers has a place (2 years in a row) at a space rock festival. The lineup is Scott Prato (JFK Jr Royal Airforce, Friends Of Mescalito) on bass and vocals, Bonnie Kane (W.O.O. Revelator) on saxophone, flute, and efx, Cliff Ferdon (JFK Jr Royal Airforce) on drums and trumpet, Chris Morrow on trombone, efx, and vocals, and Tim Byrnes on trumpet. Three of the 7 tracks are from the band's performance at the previous Strange Daze festival in 2000. "Straight Story" opens the set with a Sun Ra big band sound, but with a dirtier, noisier edge, in part due to the recognizable sound of Bonnie Kane's sax. "Miles Of Ridge" is a beautiful noisy free-jazz piece with quivering, screeching, and droning electronic efx to give the music an extra freaky kick. "One For All" is the standout of the SD2K tracks being less of a jam then a continual buildup of tension, and the electronics are at the forefront swirling and streaking across the skies like comets. Hearing all this alongside the horns is difficult to describe but suffice it to say this that the band do a good job of bringing together a few different worlds to present something very much from a world of tomorrow. Jazz and space coincide comfortably, and given that the various members come from such diverse groups as W.O.O. Revelator, JFK Jr Royal Airforce, and Friends Of Mescalito, I can see that there's a laundry list of interests and influences contributing. Another three tracks are from a performance at ABC No Rio in New York City. The real surprise of this set is the 16 minute "Promises", one of the more purely space tracks I've heard from WOT yet. The jazz is in evidence but there's a heavy jamming space sound that reminds me of Alien Planetscapes. The band cruises along while the synths rip with abandon, the bass kicks out a steady line that holds the pace, and the horns quite capably take the role that a guitar normally would. I've said it before but it's worth repeating that bands like WOT prove that a saxophone can be just as much of a cosmic lead instrument as the guitar is. Listen to this tune under the headphones and then tell me if you disagree. "Check List" is similar in it's heavy use of electronics but more rock and cool lounge jazz than the big band sound. In summary, jazz fans who read Aural Innovations could do no better than to check out WOT. And space fans who dig Sun Ra or have tasted Alien Planetscapes in their big band phase would most certainly enjoy WOT. 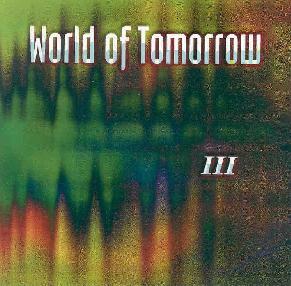 For more information you can visit World Of Tomorrow at the W.O.O. web site at http://www.wooweb.com. At that site you'll also find info on other cool bands like W.O.O. Revelator and Friends Of Mescalito.